Falun Dafa was first introduced to the public in Changchun, China, in 1992. 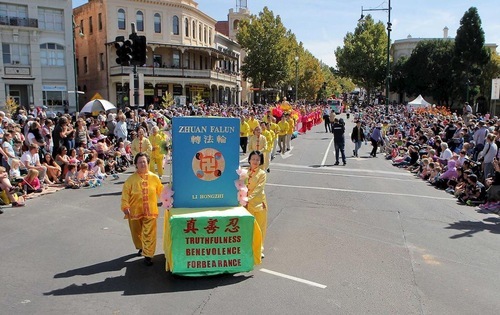 After its founder, Master Li Hongzhi, lectured in Sydney, Australia, in August 1996, the first practice site was set up in Cabramatta in northeast Sydney. The first outdoor practice site in Melbourne was established at a downtown park in late 1996. The first practice site in Queensland was set up in New Farm, Brisbane, in July 1997. After an advertisement for free classes was posted in a local newspaper, dozens of people came to learn about Falun Dafa. The first practice site in New Zealand was established in New Lynn, Auckland, in 1998. There are now nearly 100 practice sites in major cities throughout Oceania. Zhuan Falun is the main book of Falun Dafa’s teachings. Many practitioners have found that repeatedly reading the book guides them in cultivating themselves and understanding the more profound connotations of the principles Truthfulness, Compassion, and Forbearance. 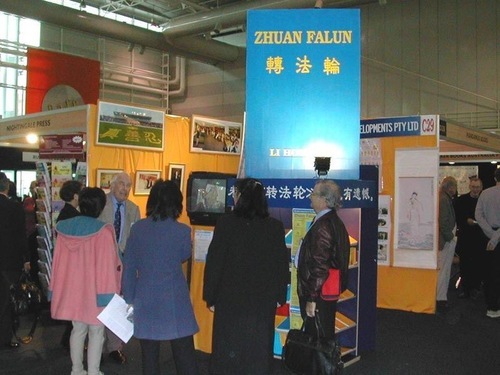 Model of the book “Zhuan Falun” during events held in Sydney, Canberra, and Melbourne on May 15, 2004. Zhuan Falun was published in Chinese and first released to the public in Beijing on January 4, 1995. Within two years, it was on Beijing’s bestseller list. In Australia, it was listed as the 14th bestseller among 5000 books that were voted via telephone, text message, and on the Australian Broadcasting Corporation (ABC) website in 2004. It was the only book on cultivation practice from the East ranked among the first 100 bestsellers. During the past 24 years, Zhuan Falun has been translated into 40 languages and is read by countless people worldwide. 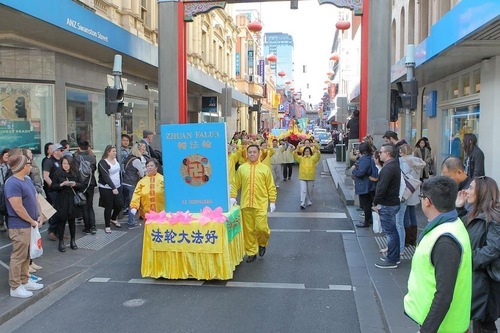 More than 100 million people have benefited from practicing Falun Dafa. By reading this book, Falun Dafa practitioners’ health and moral standards improve, and they come to understand the meaning of life. They experience immense changes in their minds and bodies. Here are some examples from Australia and New Zealand. Ms. Tao Yuefang met Master Li during the East Health Expo in Beijing in 1993 and began practicing. She attended the first public release of Zhuan Falun in 1995, and several of Master’s lectures held elsewhere. Daniel Cameron, a 29-year-old practitioner from Melbourne, started practicing Falun Dafa in 2005. A neighbor told him about the spiritual practice when he was 16 years old. He searched the Internet to learn more and downloaded Zhuan Falun. After he read the second lecture, he decided to practice. Practitioner Zou said, “I was born in a village in China in 1949. Life was hard and I nearly starved to death. I also had several health problems, and I was miserable. “I was fortunate to see the video of Master’s Lecture in Guangzhou, in March 1999. As soon as I got the book Zhuan Falun I eagerly read it. My presbyopia (farsightedness) disappeared after I read the book once, and I can read even the smallest font now. I have now read Zhuan Falun countless times. “Even though I was subjected to the Chinese Communist Party’s (CCP) persecution, my health has improved. After reading Zhuan Falun many times, I began to recite it. I’ve now recited the book more than ten times. 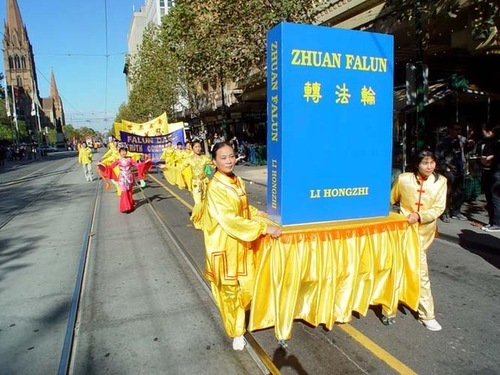 Model of the book “Zhuan Falun” during a parade in Melbourne on July 16, 2016. Many people watched the event in Chinatown. Ms. Wang is 51 years old and very healthy. She had a herniated lumbar disc and her back was numb. She was mostly bedridden and her life was miserable. Her life changed on January 5, 1998, when she received a copy of Zhuan Falun. She read it in three days and asked a practitioner to teach her the exercises. Her herniated disc soon healed. She reads Zhuan Falun every day, and in 2009 she started to memorize and recite it. She has now recited it nine times. Before she left China, Ms. Wang and her relatives opened two shops. She handed out information about Dafa and the persecution to her customers so they would know the truth about the practice. After she filed a complaint against the former CCP leader who initiated the persecution, she was targeted and subjected to persecution herself. She moved to Melbourne in 2017. While working to make ends meet, she continues raising awareness of the persecution. Ms. Wang said she has a deep appreciation for Master and Falun Dafa and hopes that more people will read Zhuan Falun.